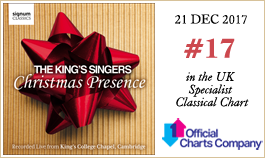 This new programme of 'seasonal favourites' from The King's Singers takes us from the austere beauty of medieval plainsong right up to the present day and was recorded live in King's College Chapel, the group's spiritual home. The essence of The King’s Singers has always been live performance. Commercial recordings are hugely important as a way of disseminating our material, and the group has always been committed to a comprehensive recording programme, but for us the best of both worlds is represented on this disc: a live concert recording. 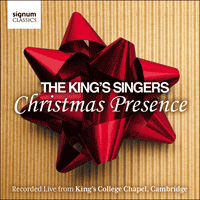 Christmas Presence gives the listener the experience of being at a live King’s Singers concert, in one of the world’s most beautiful buildings (and acoustics!) from the comfort of their own home. You can be assured that there is nothing here other than what we produced on the night itself; and what better a season to celebrate with music than Christmas? Our programme for this special concert takes the listener through various ages and styles of music, from the Renaissance to the present day, and we feel it would make the perfect accompaniment to your Christmas morning—beginning with the sacred music that celebrates the birth of Jesus, move through more modern carols familiar from church and cathedral services across the nation, and ending with the musical trimmings that your roast turkey deserves!